With Rex Hamilton, MD, you will find state of the art technology throughout all aspects of the LASIK experience. Let us walk you through the entire process below, and give you a sense of the most comprehensive LASIK experience available in Los Angeles! LASIK surgery with Rex Hamilton, MD, has enjoyed enormous success for more than a decade now due not only to the cutting edge laser technology used during surgery, but also because of the comprehensive screening process utilizing the very latest diagnostic technology to determine your candidacy for LASIK. 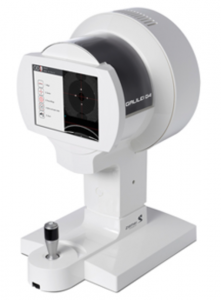 Rex Hamilton, MD, uses the GALILEI G4 corneal mapping system during the refractive surgery screening process. This amazing tool acquires a detailed, topographical map of the front and back surface of the cornea, the window on the front of the eye. Dr. Hamilton has been using this type of mapping for more than 15 years and has published extensively on the benefits of this advanced technology. 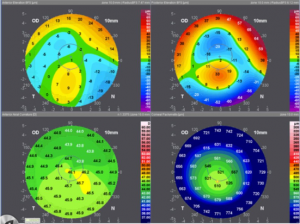 It is critical to accurately map both the front and back corneal surfaces to determine the overall health of the cornea. Much like a topographic map identifies areas of elevation for a hiker, the GALILEI system provides a detailed map of elevations and depressions, steep and flat areas, for the both front and back corneal surfaces. In addition, the system measures the corneal thickness across the entire cornea. This information is vital in identifying whether or not the patient’s cornea has enough tissue to safely treat their nearsightedness, farsightedness and astigmatism. A disorder known as keratoconus can exist without a patient being aware they have it. This disorder is characterized by a cornea that is biomechanically weaker than normal. Performing refractive surgery in such a cornea can lead to a worsening of the overall corneal shape, leading to decreased vision. While using the GALILEI G4 to screen patients does not guarantee keratoconus detection, the system has the most advanced algorithms available to detect this abnormality. Appearance of normal cornea on Galilei maps. Upper right map is of the back surface of the cornea. Appearance of abnormal cornea on Galilei. Compare the upper right map with that of the normal cornea above. The red “hot spot” identifies an area of protrusion, indicating the cornea is weak and should not undergo LASIK. Dr. Hamilton has published a number of studies, including several using the GALILEI system, to help develop these algorithms for early keratoconus detection (see references below). *B Sonmez, MP Doan, DR Hamilton. Identification of Scanning Slit-Beam Topographic Parameters Important in Distinguishing Normal from Keratoconic Corneal Morphologic Features. American Journal of Ophthalmology 2007; 143(3), 401-8. *ME Sy, A Ramirez-Miranda, S Zarei-Ghanavati, J Engle, J Danesh, DR Hamilton. Comparison of posterior corneal imaging before and after LASIK using dual rotating scheimpflug and scanning slit-beam corneal tomography systems. Journal of Refractive Surgery 2013; 29(2), 96-101. Once all your measurements are completed, Dr. Hamilton and his colleagues use a sophisticated software program that analyzes your unique characteristics (e.g. age, gender, amount of correction, environmental conditions, etc.) to determine the optimum laser setting for each of your eyes. Dr. Hamilton and his colleagues presented a paper at the American Society of Cataract and Refractive Surgery meeting describing an advanced nomogram he developed to optimize patient outcomes*. A nomogram is an equation derived using previous patient information to provide the best laser settings for optimized future patient outcomes. * JB Biebesheimer, DR Hamilton. 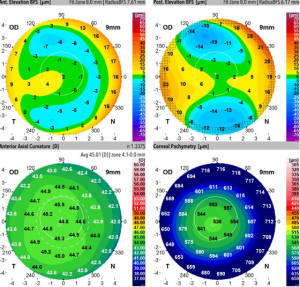 Development of an advanced nomogram for LASIK surgery (paper). American Society of Cataract and Refractive Surgery Annual Meeting, San Francisco. April 2009. Dr. Hamilton uses the highest quality Laser Visumax-Zeiss! “The VisuMax® Femtosecond Laser Its remarkable features are its precision and innovative detail. 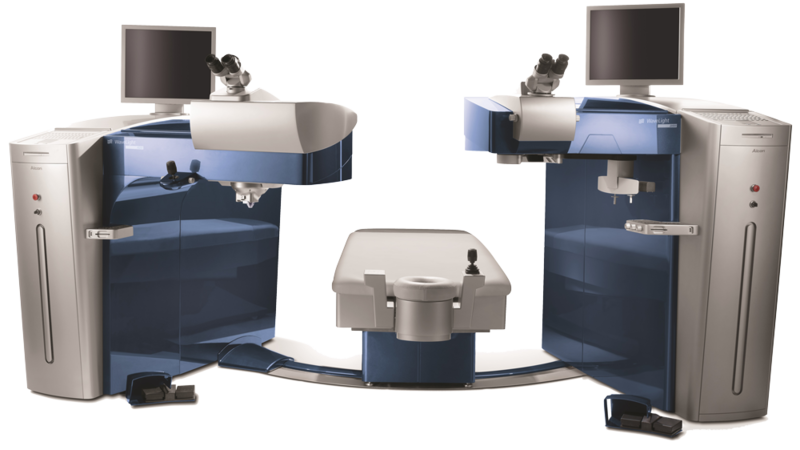 With the VisuMax®, Zeiss is significantly shaping the world of refractive surgery. This groundbreaking laser system employs high-performance femtosecond laser technology and is characterized by its outstanding cutting precision, highly efficient speed and gentle treatment technique”. The accuracy and predictability of the VisuMax® laser have allowed some patients who were previously ineligible for LASIK to now have the procedure. With the FS laser, unlike with mechanical instruments, your surgeon is able to precisely program the dimensions of your flap (diameter and thickness) based on what’s best for your eye. Dr. Hamilton and his colleagues published a scientific study suggesting the use of a femtosecond laser to create the LASIK flap has a more consistent and predictable effect on corneal biomechanics (i.e. strength) than the use of a microkeratome (blade) system. The final step in the LASIK experience is the reshaping of the cornea. An excimer laser is used to precisely remove microscopic amounts of corneal tissue to change the curvature of the cornea. The ideal excimer laser is fast, precisely controlled with advanced eye tracking and comfortable for the patient. The Eye-Q excimer laser is the fastest laser available in the industry. At 400 Hz, it is 8 times faster than its predecessor. Faster treatment times translate to more consistent and predictable patient outcomes as well as an easier, more comfortable patient experience. With speed comes the responsibility to track the eye precisely to ensure every pulse is placed in the exact, intended location. The Eye-Q eye tracking system is the most robust currently available, reliably locking on to the pupil regardless of eye color or lighting conditions. Contact one of our staff today to set up your complimentary LASIK evaluation!